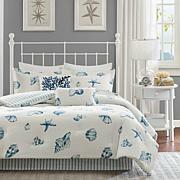 Lay back and relax in the Brisbane Bedding Collection. This beautiful abstract leaf pattern is embroidered on cotton and framed with flat piping. Decorative accents and details add depth and dimension to this collection for a look you'll love to come home to. This comforter is absolutely beautiful. It is exactly what I was looking for.